Is humour a good thing in advertising? I used to believe yes it is as long as it’s tasteful. (But what’s tasteful and who decides?) I now believe it needs to be used with caution and only when tested with whom it is intended. So what’s made me change my position on this. 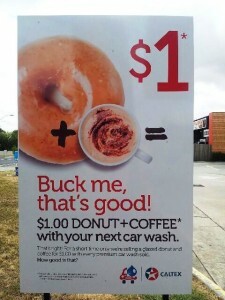 Quite frankly it was this ad displayed at a petrol station. I saw it recently and thought it’s a bit risqué and put it up on Facebook to garner some other opinions. I was surprised at what I discovered. Quite a number of people didn’t get the joke. For those unfamiliar with the term buck the ad didn’t make a lot of sense. I was gobsmacked! The lesson: Never make assumptions that jokes are universal. Always understand your audience. But clearly the word buck seems to be popular at the moment!